The whiskey sour is a very popular drink recipe. 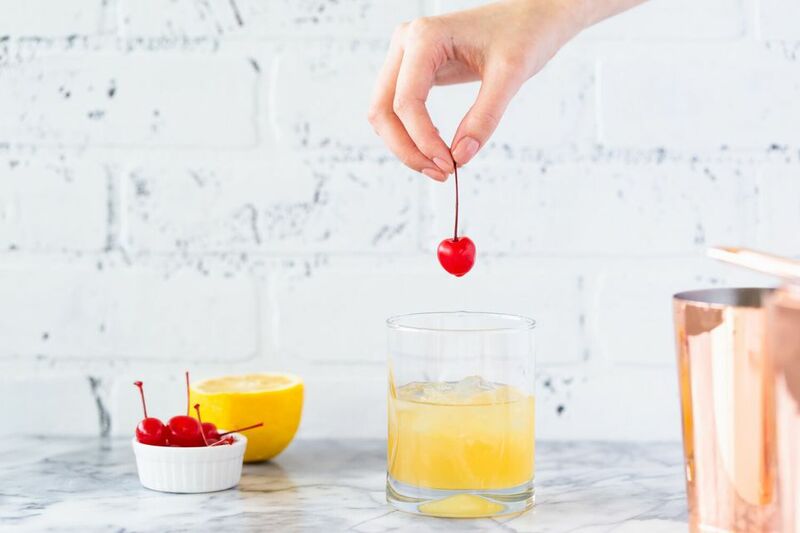 It's one of the best classic cocktails and is very easy to mix up, forming the base for the entire family of sour drinks. There are also a variety of adjustments you can make to perfectly suit your taste. As the name suggests, this cocktail is sour, but the sweetness of some whiskeys and the simple syrup offset and complement its tartness. Balance is key with the whiskey sour. It is best to stick to the pours suggested in the recipe, give it a taste, then adjust your next drink as needed. Just in case you need a reason to mix up this drink, National Whiskey Sour Day is August 25th. In a cocktail shaker filled with ice cubes, pour the ingredients. Strain into a chilled sour glass or over fresh ice in an old-fashioned glass. The key to a great whiskey sour is to use fresh lemon juice. Bottled lemon juices are either too sweet or too sour and they will significantly affect the quality of your drink. If you add soda to this drink (or any sour) you will have a Collins. The whiskey version is a John Collins and it's a refreshing change that you're sure to enjoy as well. With every new style or brand of whiskey you choose, you will give this cocktail a unique flavor profile. Most drinkers prefer bourbon, though a good rye whiskey makes an excellent sour as well. As you switch from one whiskey to another, you may need to adjust the sweet and sour elements. The Canadian Club sour, for example, picks up the citrus aspect when mixing with Canadian Club 12. Others may need a little more syrup, while some whiskies are best with the optional egg white. If you choose a Scotch whisky, you have a Scotch Sour. It's a little different than the standard whiskey sour and often skips the sweetener completely. The Frisco Sour is a popular variation that uses Benedictine as the sweetener and employs both lemon and lime for the sour. While those are rather simple, a recipe like the Old Thyme Sour is quite complex. It pairs Irish whiskey with St. Germain, Green Chartreuse, cinnamon, and thyme. It's quite fascinating and a perfect example of where you can take your own sour experience. Almost every distilled spirit in the bar has made it into a sour cocktail at one time or another. It's quite simple and all you really need to do is switch out the whiskey for gin, rum, tequila, or vodka. Just as you would with different styles of whiskey, adjust the sweet and sour to suit the new liquor and your taste. When it comes to brandy, flavored brandies like apricot are popular in sours. The pisco sour is another brandy version that is very common and it almost always includes the egg white. Liqueurs are not strangers to the sour formula, either. They often act as the base and produce some very interesting drinks. Since these spirits have sugar, it's often best to reduce or eliminate the sweetener. While many liqueurs can work in a sour, the most popular are amaretto, Grand Marnier, Kahlua, and Midori (this makes the Grinch cocktail or Midori sour). Though it's not sweet (and technically not a liqueur), absinthe makes a nice sour drink as well. Sour mix is a popular shortcut that combines the sweet and sour elements of this drink. While it is an easy option and many sour recipes suggest it, you do lose a bit of control. If you opt for a sour mix, make your own. It is very easy and often produces better drinks than most commercial brands. If you would like to play around with the sour ingredients, the whiskey sour 101 offers some fun inspiration. In this recipe, grapefruit and lime are paired with honey and a honey liqueur. A traditional recipe for a whiskey sour includes an egg white. This tends to tame the sourness of the drink and make it a bit smoother. The use of raw egg is a matter of personal choice, though. It has fallen out of favor for many drinkers because of the potential for salmonella, though the risks are very minimal. When using egg, it is generally preferred to serve the drink on the rocks. You will also need to put some serious shake into the drink and do so for at least 30 seconds to ensure it gets mixed properly. How Strong Is the Whiskey Sour? Assuming that you pour an 80-proof whiskey into a whiskey sour, it is a relatively mild 14 percent alcohol by volume (28 proof). This is about half the strength of a Manhattan, so in comparison, the sour is a lightweight. The whiskey sour has been around for over a century. Its official debut was in Jerry Thomas' 1862 "The Bon Vivant's Companion" (or "How to Mix Drinks"), which was the first published bartending guide. Its roots, however, can be traced to a century before that. Sour drinks, in general, were initially created to fight off scurvy among British Navy sailors during the 1700s. This was often done by adding lime to the rum rations, inspiring drinks like the Navy grog. Not only did it ward off disease, the rum or gin (and sometimes whiskey) helped preserve the perishable fruit juice on long voyages. From there, a little sugar was added to enhance the citrus-liquor combination. The result was a more drinkable beverage that was actually quite tasty. These eventually became known as the sour family of drinks and every variety has remained popular through the generations since.